Entertaining the world, one story at a time. 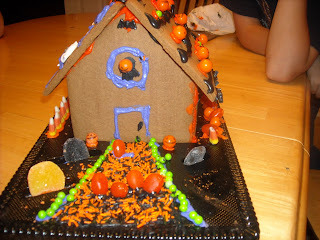 Haunted ginger houses and painted pumpkins were a big part of my Halloween fun this year. 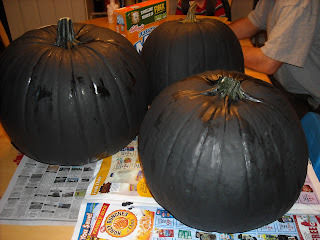 Unfortunately I failed to take picture of my completed pumpkins all together so I just have the one documented. We had a competition at work to see who could create the best pumpkin so I had a good excuse to do some damage with a paint brush. MASQUERADE: Paper faces on parade. 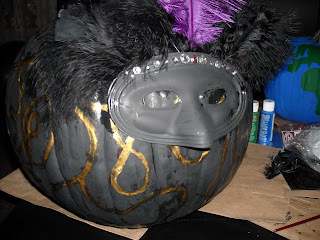 The other 2 pumpkins were painted all black and one had the theater faces painted in white while the other had the Phantom of the Opera mask and we laid a rose next to it. Our group didn't win but we had a lot of fun. 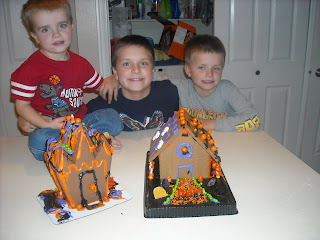 Decorating gingerbread houses is the perfect combination of a few of my favorite things; decorating, holidays, candy and eating... While Ashlyn and Trevor were on the cruise the boys and I decorated a house for FHE. 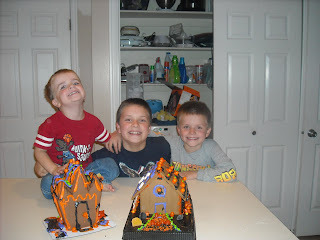 We had a lot of fun, and I'm getting pretty freakin excited about decorating Christmas houses... In fact I think I want to learn to make my own gingerbread this year. The Ketchum - Williamson Family!